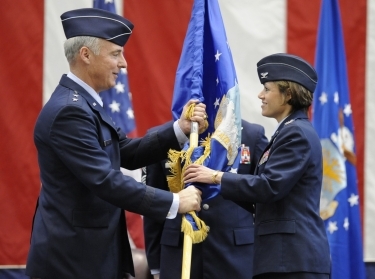 Women are underrepresented among the Air Force's senior leadership, which could be robbing the service of the potential to improve innovation, agility, and performance. Air Force Chief of Staff Gen. David Goldfein has recognized the value of diversity, stating that “recruiting and retaining diverse airmen cultivates innovation. Like different aircraft and missions make up one Air Tasking Order, different people make the best teams when integrated purposefully together.” The Air Force has worked to address diversity in the service through a series of diversity and inclusion initiatives, and it continues to work to improve demographic representation within its ranks, including the representation of women. One factor contributing to this underrepresentation is that women tend to leave the active-duty Air Force at higher rates than men. RAND Project Air Force undertook research to better understand the factors that female Air Force officers consider when deciding whether to remain in the active-duty Air Force. The project team conducted focus groups with female officers in mid-2016 from multiple installations. In the Air Force, female officers currently make up 21.1 percent of officers in pay grades 0-1 (second lieutenant) through 0-5 (lieutenant colonel), but only 13.9 percent of officers at the 0-6 level, and only 7.5 percent of officers at brigadier general (0-7) or higher. In addition to promotion-related differences, research finds that persistent differences in retention are important drivers of the differences in career progression for men and women in the Air Force and military services more broadly. Most Air Force officer occupations require a four-year active-duty service commitment. Pilots make a 10-year active-duty service commitment, and both combat system officers and air battle managers make a six-year commitment. As expected, officers in aeronautically rated occupations have higher cumulative continuation rates in general because they tend to have a longer initial service commitment. However, female officers tend to have lower overall continuation rates than male officers in both aeronautically rated and non-rated occupations. For example, the majority of male non-rated officers (55 percent) are retained through 10 years, while the cumulative continuation rates for female nonrated officers at that point is only 37 percent. The gender differences among rated officers are even larger than among nonrated officers. Through 13 years (at which point initial service commitments would have been complete), 63 percent of male rated officers remain, on average, compared with 39 percent of female rated officers. Thus, understanding the reasons for these differences in retention rates is important for improving overall female representation within the Air Force, including among senior leaders. Female officers said a new maternity leave policy that extends leave to up to 12 weeks is a step in the right direction. Still, some participants expressed concern that taking longer maternity leave could negatively impact their careers. In addition to this change in maternity leave policy, some female officers raised the issue of extending paternity leave and adoption leave, saying such a change could reduce the stigma associated with only female officers taking maternity leave. Female officers also indicated that frequent moves and deployments were challenging for their civilian spouses. They noted that civilian male spouses often faced a lack of support from Air Force spouse groups and programs. For couples in which both spouses are in the military, separation due to incompatible assignments and back-to-back deployments were described as difficult to endure. More than half of the groups raised the issue of inflexible career paths as a reason for female Air Force officers to leave the service. The groups described the Air Force career pyramid as a rigid path that allows for very little deviation and few alternatives. They perceived this strict career path to often be incompatible with family and personal lives. When asked about the importance of leadership on their retention decisions, they discussed the difference that a supportive leader can have compared with a toxic one on job satisfaction, motivation, and desire to remain. Most groups also discussed the importance of having female role models in senior leadership positions, noting they rarely see female leaders who are married with children. When asked how, if at all, gender composition across career fields influenced retention decisions, female officers had mixed responses. Many in male-dominated career fields reported often facing sexism and the existence of an “old boy's network.” Some also associated male-dominated career fields with experiences of sexual harassment and assault. A few also cited cases in which either they or people they knew had left specifically because of a sexual assault. Over half of the groups mentioned other retention factors including a number of Air Force benefits that were important in deciding to remain in the service, like health care, education, and retirement benefits. By drawing upon and integrating this focus group feedback, the RAND team was able to offer specific recommendations to promote female representation among officers. These recommendations fell into three broad categories of action: dissemination of additional information or education, enhancements to existing programs or policies, and broader structural changes to the personnel system. The combination of senior leader involvement, internal focus, and analytically based recommendations have enabled progress within the Air Force. The service recently modified or established policies designed to address some of the retention issues noted above. The updated maternity leave policy extends maternity leave and defers fitness tests and deployments for one year after the birth of a child. The Career Intermission Program allows for inactivation and transfer to the Individual Ready Reserve with partial pay for up to three years before returning to active duty. New service initiatives include working to avoid involuntary assignments that separate dual-military couples and working to provide new parents in the Air Force with additional support and guidance by pairing them with other airmen who have been able to balance work and family. Continued pursuit of these and related initiatives, such as expanded subsidized child care, increased paternity leave, and designated nursing facilities, should allow the Air Force to take better advantage of the many benefits of a more diverse workforce. Miriam Matthews is a senior behavioral and social scientist at the nonprofit, nonpartisan RAND Corporation. This commentary originally appeared on Dallas Morning News on August 4, 2018. Commentary gives RAND researchers a platform to convey insights based on their professional expertise and often on their peer-reviewed research and analysis. Kirsten M. Keller, Kimberly Curry Hall, et al. Nelson Lim, Louis T. Mariano, et al. Previous Blog PostPotential Benefits for Most New Yorkers but No Free Lunch: Tough Decisions for Single-Payer Health Care in New YorkNext Blog PostBringing Back Sanctions Will Hurt U.S. Allies and Iran, but Will It Help the U.S.?